WriQ was introduced to us by one of Amanda Zengel’s ELL students at North Albany Middle School. 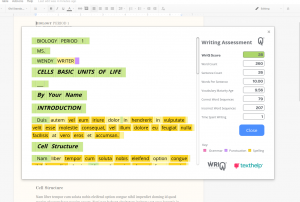 It is still in its early stages but looks like a fabulous tool to give students quick feedback on writing within Google Docs. Visit their website to learn more about WriQ. Teachers and students are able to get the free Add-on within Google Docs.